Your skin is a reflection of your health, so great nutrition is the first step in your skincare regime. We believe in a holistic approach to beauty and wellbeing. By nourishing from the inside you turbo boost the effects of your skincare regime while achieving maximum long term benefits. Advanced Nutrition Programme™ supplements aren’t just for women, they’re for anyone interested in great skin and vibrant health! 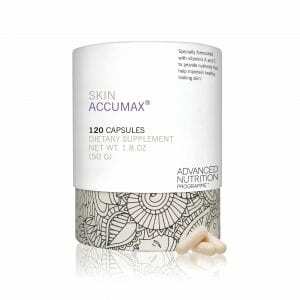 Skin AccumaxTM contains a completely unique patented and exciting ingredient called DIM which works from the inside out. This skincare supplement contains a super-high concentration of active ingredients for people prone to problem skin. They are your skin’s ultimate complexion enhancing power team!